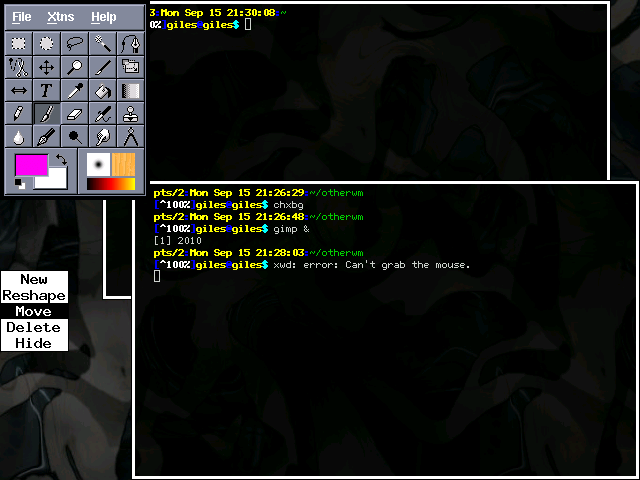 A screenshot of w9wm. 9wm's appearance is identical. Note the complete lack of titlebars, and thus the need for a menu to move or resize windows. Hmm. It appears the last version of 9wm was issued in 1994, and I'm using that. Not sure of the number. As for w9wm, I'm using an RPM that claims to be version "1.0" from 2000, but the current maintainer's numbering has only reached 0.4.2 (August 2003). There's not much of it, but the WM is very simple. Enough to use it successfully. These two window managers are so similar that I decided to cover them in one entry. 9wm was originally designed to emulate the 8-1/2 Window Manager from the Plan 9 operating system. I can't judge how successful that was. w9wm is an addition to 9wm to add workspaces. I hated them. I just thought I'd mention that, let you know that any suggestion of objectivity is gone. They have no title bars, and the only way to move, resize, or iconify a window is to access a menu by right-clicking on the desktop. The full menu can be seen in the image above. The "New" menu item starts a terminal. Every new window has to be placed: ie. when a new window is started, the cursor turns into a cross and you have to click and drag somewhere to shape the new window. The only difference in w9wm is that a middle-click yields a menu that says "One" "Two" "Three" "Four" to allow you to choose a workspace. The only upside I could find was that "exec 9wm -term aterm" would at least let me get the terminal emulator I wanted. Both are very light on resources. Very ugly. Very awkward to use.